You've probably heard a lot of talk about steel and aluminum tariffs in recent months so it probably comes as no surprise that the cost of those big metal boxes that keep your home cool is about to go up. 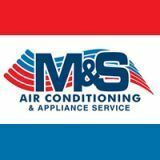 If your system is close to 15 years old, there's no time like the present to get a new Air Conditioning system! If you're in Broward or Palm Beach call M&S at 954-421-3680 or 561-274-6557 for more information.